A second visit to York, where the team discovers more family gems as hundreds descend on the Yorkshire Museum. Browse content similar to Yorkshire Museum 2. Check below for episodes and series from the same categories and more! so we've come to an apt location - the Yorkshire Museum and Gardens. that have been literally unearthed from beneath the ground here. as we return for a second visit to York. planning a home for the new discoveries exciting scientific thinkers of the day. the museum in the heart of York. It opened in 1830 and it was something of a pioneer. it's one of the first purpose-built museums in the country. because this place was an exclusive club. because women were not allowed to be members of the York Philosophical Society. it was for a very steep shilling. and even then it was just once a year, at Whitsun. and they've had quite a few in recent years. known as the "Vale of York Hoard". Look at this - it's another amazing find here in the museum. It's called the "Middleham Jewel"
by an amateur detecting enthusiast. with this huge sapphire here. from the dangers of childbirth. some tiny fragments of soil from a shrine or some kind of holy site. We'll see more excavated treasures later in the show. In the meantime, let's see what our experts are digging up. You know, everywhere you go in York, you fall over pieces of stone. and you bring in these. Where did you get them from? This one here from a dealer, it was languishing in a garden in Kent. and when I saw it, I had to have it. to collect these pieces of stone. -and they end up in people's gardens or used as doorstops. and sooner or later, there's not going to be much left. when you say they are early works of art. -This is quite the most stunning one, isn't it? I don't think it's medieval. I think it's a bit later than that. 1500-1600, something like that. on the side of Hogwarts, perhaps! I don't know, something like that. if you look at the face on the lion, it's much more a Neo-Classical face. or possibly even the 17th century. And then the two down here... tell me about this one here. because I thought it was older. -It had been re-used in a 19th-century wall. That's why he thought it was Victorian? I said, "Maybe that's why it's NOT Victorian". sensible pieces of stone like this for their work. and the hair, and it's kind of that grotesqueness that I liked. because these all have spirit, don't they? -There is something in them that actually comes through. -This lion, I would put at about 17th or 18th century. I think about the people that carved them. Well, I think about them too because they would have ended up very high on buildings, wouldn't they? And you would look up at them, if you could actually see them at all. I can see why he thought it might have been Victorian. -But I would have thought it was earlier. I think the thing about this whole collection is it has spirit. -I paid 500 for that. -I paid 200 for this, delivered. I think this was about 400.
and I paid 1,500 for that but I just thought it was sweet. Well, I have to say, you've done incredibly well. as far as these pieces were works of art. but all good sort of 16th, 17th, 18th century here. let's add a nought and say £5,000. I didn't think that, I really didn't. I would have been happy with anything around 500, you know? Prices on the others, you know, the prices you paid are very little. -As you say - except that one possibly. -The wine, I assume, was very good? -It was, a good day. Now, they say all the nice girls love a sailor. Do you love your sailors? That would be giving the game away, wouldn't it, really? -What, just that one there? Not his two mates? I love it too. It is... It's just very, very stylish. So is this something you bought? and it was given to her when she was in her late teens. to go to... I think it was South Africa. They were going to go and set up as a farm over there. -It was a parting gift from them. -So they were sailing off? -And they left their sailors behind. -It was made in France, in Paris. which was from the man who founded it, Jean Born, in 1908.
reversed them and added the J.
but most collectors call it Rob-J. but they commissioned the very best designers to make pieces. and shops that only sold the very best pieces. and Jean Born continued that tradition. this line of decanters in 1928 and they were very successful. early '30s, it screams Art Deco. their faces have this slightly diabolic look. there's a joie de vivre about it. so no matter where you pour it from, it won't dribble. and I think that price would be £2,000. Several more, if it was in euros. she'll be delighted to hear about that. with a rather expensive bottle of liqueur. because it doesn't fit that sort of grandfather clock look. That's partly why I like it, because it is different. So how did it come to you? he seemed to know my grandfather - and would strike it down to him. My parents used to dread him coming home! all striking at different hours, but he seemed to love it. -so in Yorkshire terms, it's ten bob. -Wonderful image of an auction house. Yes, and my eccentric grandad. This business of taking bids off the wall and that sort of thing. -and he knew your grandfather would have it. -It was a large farmhouse. -There he was, slumbering at the front. Would you like to hear where it comes from? -Oh, please, there's no markings on it. but I do know that the movement is German. -And the case is almost certainly French. -Gosh, well, you do surprise me. and it has this lovely organic quality about it. Yes, lovely, because it's got a dandelion on the face, which I think is rather nice. that starts at the bottom and works up to the branches at the top. -So that clock's about 100 years old? It is just possible that it's got a bit of German blood in it. -These grilles here are slightly Germanic. If you can imagine the grilles on a radio, on a wireless set. -Do you know what I mean? It has that feel about it. but I'm almost certain that the case is French and the dial and movement are German. Goodness me, I was thinking somewhere about £600-£800. -Well, I think it's £1,000-£1,500. Well, it's not for sale. I love it. It's going back in my dining room. Well, you've done a beautiful job of restoration too. Oh, very kind, thank you very much. and what they really like is sealed examples. So you start with a bottle like that and it's nothing special. But when you add THAT to it, that changes the game. A sealed example of an early bottle from 1770 is a good thing. Have you known it from new? No, no. Maybe about ten years! And how did it come into yours? and she was going to throw it out. I asked her if I could have it, and she said yes, so I took it. Bloomin' great! Well, I think that's really nice. 1770. What are we, 240-250 years ago? Do you know anything about James Oakes Bury? was James Oakes and he lived in Bury St Edmunds. a prosperous man, and you can trace him. you can actually buy his diaries and follow his life. -And that makes a difference to value. -So you start with a bottle like that and it's £100. -which is not bad for something you blagged as a removal man! -Yeah, so what's it worth? -I was going to say 20 or 30. -It belonged to one of my ancestors. -Rear Admiral John Manley, I believe. but I'm not quite sure exactly of the date. -OK. And so he could well have used this. the battles he had partaken in. It does show a lot of wear and tear. I refer to the date, and it's down there, 1754.
scientific instrument maker. You don't get a better name than that. -Australia is sort of, obviously, the bit there that's missing. Look at that, Australia is only partly delineated. I can just see Van Diemen's Land there. -sort of dot in the middle of the ocean. "Unknown", so I mean, it's fantastic, isn't it? -Your ancestor was sailing the seas, very unknown seas. -and even the little clasps, they're all there. -Let's have a look at the fella who this belonged to. It's a real treat to put a personality to an object. This is his ship, yes. -were you aware of that? -No, I didn't know that, no, no. and the sort of number of guns. This was probably on board that ship for many a decade. Something completely different, I fear, hiding in this box. Those are his buckles, and I know that. Wow, that's all I can say, absolutely wow! -These are the best shoe buckles I think I've ever seen. I just found them in the bottom of a drawer when I was clearing out. -You lucky thing, you lucky thing. No, I don't think... They're paste. -..which is English lead glass. was done, more often than not, by top quality silversmiths. The best ones were always set in silver. These have got... I think that's the leftovers of the leather polish from your shoes. -These would buff... This is probably solid silver. Yes, I haven't ever cleaned them or anything. No, they don't need cleaning, really. And things like this were made... from the sort of 1660s. Pepys wore them. Out of fashion by the 1790s. These are enormous. This was the age of dandyism really and the bigger, the better. So what a potted history! that took him to all the various battles he no doubt partook in. -I've not seen a better pair. I think they're worth £1,000 to £1,500. The globe. That's a really good one. my estimate would be £5,000 to £7,000. both printed and in pencil, bottom right. and it's of Newhaven Harbour in East Sussex, isn't it? -It's not something you see very often. Why is it yours? It belonged to my father-in-law and he would have bought it new. Oh, he wanted to be modern? Oh, very! We've still got some of the modern furniture. and it's been in the family ever since. because he'd done woodcuts on a smaller scale and monochrome. and of course it's a different medium, really, it's a lithograph. -He also called it his homage to Seurat. -Right, I can see why. -Yes, you sort of can, can't you? -It's got that open light about it, hasn't it? and there's no people milling around at all. and even these clouds sort of hang in the sky, statically. very strongly lit and highly stylised to suggest that light. In this way it's extremely modern. and British take on modernism for the late 1930s. Anyway, terrific print, and what's going on here? but we didn't actually realise until we took it out yesterday that he'd actually left that little bit there. it was just a print that he bought as a young man that he really liked. that was the word they used. So I thought, mm, perhaps we better bring it in and have a look. Yes, it is a rare print. I'll tell you about the missing bit first. It's probably worth about 2,000 quid. Well, I thought the whole picture, if we were lucky, it would be worth 1,000. No, it's worth about £4,000 as it is. That's fantastic! Well, it's still going up in the clip. -No, I think we'll frame it properly when we get home. It's still going up on the wall. But it is a really, really wonderful image, I just love it. with a treasure from Yorkshire, aren't we? and in a way, it's an object of national importance. Tell me all about it and what your relationship is with it. and it's recently been acquired by the Yorkshire Museum. And of course everybody's itching to know where and how you found it. with a metal detector on a York club outing. What did it feel like, when you first saw it? What was it, to you? they've come back with 10th or 11th century. 10th or 11th century, my goodness me! and precious stones are untouched by that, gold is untouched by it. and I think that might be a key to the age of it, mightn't it? that's why they came up with the later date. so there's a little bit of mismatch with the dates at the moment. We still need to do more research. because York is the great Viking centre, isn't it? It's the most marvellous connection if one could make that. -I think without a shadow of doubt, it's a man's ring. and the sapphire is critical too, isn't it? Tell me about that one. -The oldest was a Roman one, 5th century. The light is falling on it. You made light fall on it. It had been in the darkness for possibly a thousand years. It's not yours any more, is it? because it's in such good company with the artefacts already there. -and that figure is public, isn't it? gets shared between the finder and the landowner. So there'll be a happy farmer in Yorkshire now. and it's now safe, and that's critical, isn't it? It's been marvellous to talk to you about it, thank you very much. to have a tweak and improve. and this is a beautiful chair but tell me, where did it come from? and it was in with the package. and then when we moved in, we found it, and it was still in the house. Wow, so just one of these left behind. So we've two of these. We couldn't bring them both down with us today. So what did you think when you saw them? Did you like them? and the low seats are really, really nice, aren't they? we realised how nice they were. what I'm going to say to you is a British design classic. It was designed in 1946 by a gentleman called Eric Lyons. which is this - for the Packet Furniture Company in Great Yarmouth. -it's called the "demountable easy chair". I'm sure you found it very easy to demount yourself out of it. just after the war. It's bent plywood, this one's covered in oak. that came out of the war effort. and new products and new ways of manufacturing were developed and this is one of these products. who were a subsidiary company that worked with Packet Furniture. But, you know, it's a fantastic piece of furniture. I have to ask, what do you think of the fabric and all this covering as well? we were going to get it reupholstered and change the fabric. the fabric is also designed by somebody really important. -It was actually designed by a lady called Marianne Straub. commercial textile designers of her day. and it got left behind in your house. And we stood on it to paint the ceiling. Well, why not? You've got to use these things for something. I'd probably say maybe stop standing on it. -I'd also say don't re-cover it. It's had a life and the life tells a story of what it is, as a chair. it's by a great designer. you'd need about £1,000-£1,500 to buy them again. This was donated to Fairfax House about 15 years ago and it's come with no information whatsoever. Now, this is the lovely Fairfax House here in York, fantastic townhouse museum. -but this isn't something we specialise in. A museum has come to the Roadshow to find out about it. -What have you found out about it? any idea about provenance or where it's come from. marked the end of the Seven Years' War. This was a complicated war and I won't go into the complexity. as far as the Prussians and the Austrians were concerned. there is more sort of declaration of peace. We've got down here it says, "Germania Pacata". I guess that means, more or less, "Germany at peace". So everything about this tells us it's peace. -the very first European porcelain factory. Augustus III who was in charge. I think this is where you're going to learn a little bit, I hope. Here you have a tantalising little paper label. It's a collector's label and it's sadly ripped off here and there. Well, a silver cabinet...of the prince and it says "Albrechtsb..."
had his cabinet of curiosities. which is a category number. So the question is, how did it get from there to Fairfax House? And the clue you gave is this family that was fleeing from Germany. I think it was in the late 1890s or the early 20th century. It's just possible that this is a perfectly bona fide sale. then one would have to think about the possibility of this having been...what's the word? it's not made of porcelain. It's enamel, it's enamelled copper. It's a lovely, lovely thing. So lucky old Fairfax House, I'd say. -And Fairfax House have no intention of knowing its worth. None whatsoever but if you happen to tell us, we wouldn't mind! You need to know for insurance. so maybe insure it for a little bit more than that. Lovely. That's very helpful, thank you. for hours and hours and hours. It does have a certain charm to it. -OK, so it's a wooden leg. -Because I can see you are not legless. Hopefully soon. It was just... It was a birthday present off somebody. That said they thought I would appreciate it. actually, no, that's not a bat, it's a wooden leg! And actually, yeah, I really do appreciate it, I love it. It's a great object, you know. but, you know, I don't know what happens in York. If a leg fits, wear it, I say. so it could even be Napoleonic. I know! When I say "Napoleonic"
I look at you, and you're going "Kerching! Kerching! Kerching!" Well, it is a bit of a kerching - I would say it is £500-£700. Now you did think that when you came in earlier on today? -I hate it, I really hate it. I've had to carry it around all day long. He won't allow it in our tent, we're tenting. and he won't let it in the tent because he's scared of it. -I like it a lot more now, I have to say. So you hate it. Why did you bring it? Why did you come along today? because I just, I love you. And I feel like you've brought me up, in a way. I really do! That's made my day! How fantastic! -It's made ours. £500-£700! Who wants to buy a leg? This is a stunning piece of furniture, how long have you had it? and it's been in my house ever since. relating to the transfer from my grandfather back in 1939. -It's going down the female line. -Yes, it will go to my daughter. So that's a trend you'll continue. As long as there are daughters to pass it on to. It's beautifully inlaid. Do you know where it's from? and in this original letter, as an Italian travelling desk. Well, Italian is right. Both pieces of furniture are Italian. -It is made of rosewood, as is the chair. Rosewood, ivory inlaid with ebony sort of borders. -to pieces of furniture from different centuries. The desk itself is of a form known as a bureau Mazarin. -is pure bureau Mazarin form. You don't normally get these superstructures on bureaux Mazarins. this is sort of different altogether. -The origins for this are 15th century Italy. -And it's known as a Savonarola chair. And Savonarola is here in person. -This central medallion is the man himself. near Florence, so 15th century origins. -17th century origins, but both made in the 19th century. -..they would have been obviously very high in value. at auction, you would get something in the region of £3,000. and it is a part of the family and...yeah. And is the chair comfortable? No, it's not. The chair is used in a similar situation as this. We have it in the hall, put coats on it, that sort of thing. It's lovely. How much do you know about your panel? and then this moved over to chemical dyes. all sorts of different possibilities with textiles. and we can even say wealthy family. Do you know what the technique is here? I have no idea, no, I haven't. but it is incredibly cleverly made. to form this amazing picture. here in the glass and the neck of the wine bottle. and that gives it the opaqueness. You can see the glass is there. Something else that I love is the actual subject matter. and this lovely cat - sitting there. She's almost redundant because the mouse trap will take over her work. And all of this is being overseen by this old lady who's spinning. So, where do you think it might have been bought from? Somewhere in Italy, possibly Rome. Florence, I think. It's Florentine. Florentine, dating from somewhere around 1890, that sort of thing. and towards the end of the century they would have made their money. -So they were able to afford something like this. I think it's fabulous, really lovely! It's so vibrant and colourful. -Well, it has a value. -And I'm going to give you an auction estimate. would be somewhere in the region of £4,000-£6,000. I couldn't believe you brought me such a huge piece of Whitby jet. Well, it was my father's. He had it about 40 years. but he also bought one or two nice things. And then that was handed down to me and we've had it about 40 years. Well, it's an amazing, huge piece of jet. And, of course, jet is fossilized monkey-puzzle tree. It's a little bit like coal. of course made highly popular by Queen Victoria with popular mourning jewellery. It's signed "John Speedy, Whitby". -John Speedy actually won a prize for the best jet carving in 1861. -And that was for a bunch of flowers. But this, I think, is every bit as good. -It is the top of the tree of jet carving. I don't think you could probably find a better piece of jet. I've shown it to several colleagues. Nobody's seen a piece this big or this good. And, as a consequence, it's worth a reasonable amount of money. to the right collector, they would pay £2,000 for this. -And how great to be here in York, just down the road. What makes it worthy of sitting on a plinth here? -It's travelled a long way. with Scott of the Antarctic when he died. as part of his Terra Nova Expedition. and he and his fellows died. and his diaries and brought it back and it was given to the company. I mean, let's talk a little bit about Scott. This extraordinary hero who was beaten to the South Pole. when he realised that he'd been beaten to the pole. He turned round, he set off back towards what he hoped was safety. 29th March, it was the end. I mean, that was the last entry in his diary. The last entry read, "For God's sake look after our people". An object of huge power. It shared those last moments with Scott. And...I don't want to handle it. I mean, I know there are white gloves available. which is an extraordinary powerful emotion for me, personally. who I think sponsored in some way, the trip. -It was kept in our archive for a very long time. We know that it was with my predecessor Joe Burr in the 1970s. I have a photograph of him holding it. Then, probably about 16 years ago, it went missing. and I decided I really want to find this. I'm going to search for it. I found this anonymous looking tin, in amongst some other tins. and thought, "I think that might be the tin". I didn't believe it for a while, so I didn't tell anyone for a few weeks. And I eventually said, "I think I've found that tin". And my colleagues all said, "Oh, well done". So there was your eureka moment, your find, the find of your career. I mean, Scott is still regarded by many as the ultimate British hero. his actions have been looked at, re-examined. Was he culpable for the loss of life of that entire expedition? for anything to do with Scott. has a wonderful museum with lots of Scott memorabilia there. It's an object which, in a way, is completely worthless. It's a tin of cocoa! Probably not much good to drink. But you look at it in another way and it is utterly priceless. It's worth a lot to us. We know that as far as value goes, it's only worth about £800. put so much into that expedition and so this is our remembrance of that. you should be putting more like £5,000 on it. fills me with dark, dark dread. and there aren't many objects you can say that about. Thank you. the most humble of objects can prove extraordinarily moving. that Geoffrey Munn looked at earlier? that these days, anyone can see. Our thanks to our hosts for making us so welcome. 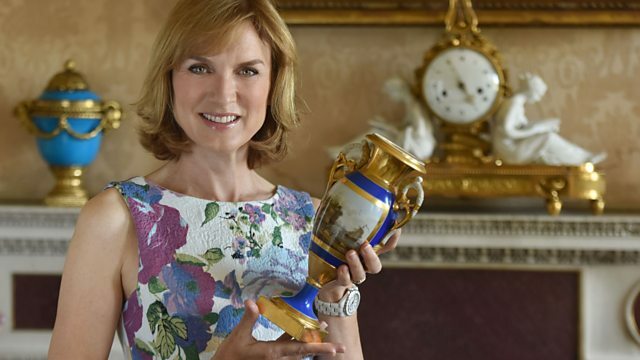 From the Antiques Roadshow team and the Yorkshire Museum, bye-bye.